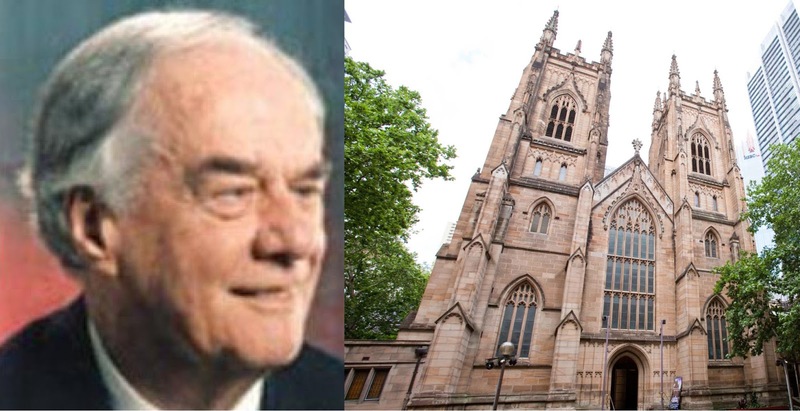 One of the people whose influence and teaching was important for me in my youth was Canon Jim Glennon (1920–2005), founder of the healing ministry at St Andrew’s Cathedral, Sydney, Australia. As a result of his own healing following a nervous breakdown, and the Spirit-filled ministry of Agnes Sanford when she was sharing in the healing ministry with Father John Hope at Christ Church St Laurence, Canon Glennon founded and maintained the Healing Service in St Andrews Cathedral. It began in 1960 with 28 people and within ten years became the largest regular service of its kind in Australia, with the cathedral packed every Wednesday night. Following his retirement in 1988 he established a healing service and teaching ministry at St Mary’s Waverley, also in Sydney, where he ministered until his death in June 2005. Go HERE for Sid Eavis' book on Jim Glennon and the healing ministry.. The particular basis of the Healing Ministry to which I want to refer is from three texts, all in St. Luke’s Gospel. The first is Luke 10:9 and is part of the words of our Blessed Lord Jesus when he commissioned the general group of disciples to go out and preach the gospel: “. . . heal the sick and say to them: The Kingdom of God has come near to you.’“ What he is saying is this: When a person is healed, they have drawn on part of a greater reality called the Kingdom of God. In other words, the Kingdom of God is God’s perfect blessing and healing is part of it. I repeat what I’ve often said before. In the Bible we find more than one thing said about many subjects. The art of interpreting the Bible is to see all that is said, and relate one part to another. Jesus said that the Kingdom of God has two sides to it. One side is that it belongs to the end of the age when he will come again in power and glory and wind up this present world order, when “the Kingdom of this world will become the Kingdom of our God and of His Christ.” This is something to which all Christians look forward. If we realise that the Kingdom of God has been established and it is that greater reality of which healing is part we can see how available healing is and the reason why it is available. It is available in response to faith because it is part of the Kingdom of God, and this aspect of the Kingdom is among you. As someone said to me: it doesn’t even have to be asked for, why ask for something you’ve got? Let me introduce my third text Luke 13:19 “The Kingdom of God is like a grain of mustard seed which a man took and sowed in his garden; and it grew and became a tree.” As it says in Mark 4:28, “. . . first the blade, then the ear, then the full corn in the ear”. Here is more information from our Lord Jesus Christ as to how the Kingdom shows itself. It is like a seed grown in the ground, and “it grew . . .”; “first the blade, then the ear, then the full corn in the ear”, and remember that the kingdom includes healing. This is part of the explanation for Divine Healing, and a very important part, too. Not only does it give great authority and assurance, but if the principles which I am sharing with you are understood and put into practice, you will find that they give you great guidelines as to how the Ministry of Healing is to be exercised. When I was in the United States recently I was given a book, Inner Balance. * It is written, in the main, by medical specialists and it is interesting to learn what the top men in the medical profession in the United States are saying about stress. Stress, more than any other factor, is the underlying cause of physical ailments. It follows that it is stress which needs to be prevented if physical illness is to be avoided; where there is illness, it is stress which needs to be healed, if healing is to be drawn upon in depth. We are, of course, not ignoring the presenting symptoms, but we are saying—or rather, people like Professor Selye are saying—that the underlying causes have to be understood and treated, if a cure is to be effected. Speaking as a medical layman, I think this is the most encouraging sign I have seen coming out of modern medicine, and I thank God it is on the increase. What so often happens is that a person is in a situation which creates a serious problem for them in personal relationships at work or at home—you name it. They take it out on themselves and it gnaws a hole in their minds and emotions. Stress has a cumulative effect, and what these eminent medical authorities are saying is that this stress, more than any other single factor, is the underlying cause of physical illness. I once ministered to a woman in this position and she said, ‘But what can I do?’ I answered, perhaps rather naively, ‘Well, you can cast your burden upon the Lord’. She was an informed and prayerful Christian, and her reply was, ‘I do that, but I keep taking it back’. I helped her by believing with her, so that our combined faith enabled her to truly and meaningfully cast her burden upon the Lord so that he sustained her in her real-life situation. When I was in the United States [in June and July of 1980] I had a most interesting experience when visiting the Good Samaritan Episcopal Hospital in Portland; there I saw the most advanced hospital chaplaincy work I have ever come across. I was told by one of the lay workers who, under supervision, visited the hospital and made pastoral calls on behalf of the chaplain that, before she left the hospital, she would have a debriefing session. The chaplain would talk things through with her, correcting her where necessary, give his support, and pray with her for the pastoral calls she had made. These sessions served to further instruct her in the work she was doing. In addition, she told me that this debriefing, which the chaplain so expertly handled, had the effect of her leaving her problems at the hospital, which meant that she never took them home. In other words, the problems did not result in her becoming stressed. I like the Living Bible translation of Philippians 4:6,7b: ‘Don’t worry about anything; instead, pray about everything; tell God your needs …’ and ‘His peace will keep your thoughts and your hearts quiet and at rest as you trust in Christ Jesus.’ It underlines the point that this is what God wants us to do—that is, not to be anxious but to pray and let his peace give quiet to our minds and hearts because of our trust in Christ. If we understand the need for this, and develop our capacity to put it into practice, we will be taking a major step forward to retaining our health—or regaining it, should we be sick at present. When I was in Melbourne last week [September 1980], I had contact with Miss Eleanor Lindsay, a lady who is exercising a remarkable healing ministry; she has a licence from the Archbishop of Melbourne to extend that ministry in his diocese. I had an hour-long talk with her during which she kindly explained to me how she went about her work. I was very interested to be told that she does not pray for the presenting problem the person has; her concern is to identify the stress factors which have contributed to the person’s illness. She then seeks to draw upon the appropriate blessing of God for the healing of those stress factors, after which, she says, it is a comparatively easy thing to draw on help and healing for the presenting symptoms. I think she is, in a courageous and effective way, acting upon the precepts of Professor Selye and others. Stress is the killer. We must be concerned, in a preventive way, as well as in a remedial way, to come to grips with it, for it is the great problem behind illness. Our loving Father, we are all in degree the victims of stress. We would so come before you now that we cast our burden upon the Lord Jesus and have peace in our mind and heart. We believe this both now and in an ongoing way. Amen. * Elliott M. Goldway, ed. Inner Balance: the Power of Holistic Healing. New Jersey, Prentice-Hall, 1979. Thanks for sharing these extracts. Apart from a couple of books, there doesn't seem to be much on Jim Glennon on the web, so your sermon extracts were appreciated.